In September 2002 Mika Vainio, Ryoji Ikeda and Alva Noto (Carsten Nicolai) were invited by The Baltic Centre For Contemporary Art for a residency. As a result of this project three live performances followed this research period. 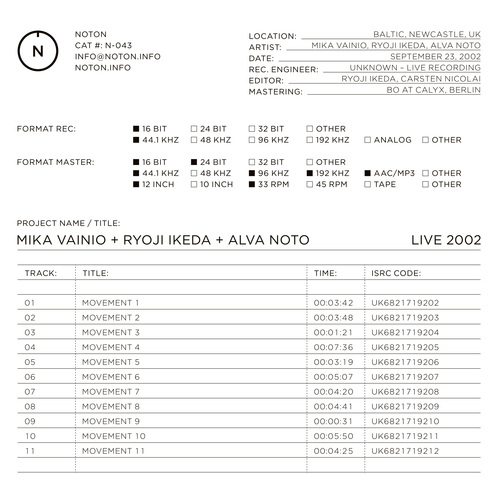 Unfortunately at this time we can't offer all the Mika Vainio + Ryoji Ikeda + Alva Noto - Live 2002 tracks as individual wavs, as some of these tracks exceed the shops maximum (9mins) download length.